MAISON KODUZEN—Add Some Color to your Interior for Spring: Pink! Add Some Color to your Interior for Spring: Pink! Let me get started on this post with a personal anecdote: the first apartment where I lived on my own was in Bed-Stuy, Brooklyn and was a railroad apartment covering an entire floor. I had defined color palettes for each room based on how I was using it: the kitchen/dining room was green and pink to gently wake me up in the morning, the living room was grey and green as a soothing, relaxing place and my bedroom was grey and dark blue to help me sleep. When I was hosting parties at home, I was somewhat always setting up the living room as the main reception area as it was the largest room - until I realized... Everyone was hanging out in the dining room. Not that the furniture layout was more convenient or the lighting better than in the living space - people were simply drawn to that area. I thought about it a lot and looked around whether at home or at other people's place and came to the conclusion that colors were the answer - and in this particular case, the color pink was key. In Feng Shui, colors have a very specific role based on the area of the space they are being used and how they reinforce a certain element. Pink is the color of the relationship area - that includes marriage, friendships, partnerships etc. It is also related to the fire element that plays a role in fame, reputation and recognition. In other words, pink is a powerful color that encourages social interactions in all shapes and forms. So no wonder why people were gravitating towards the dining area of my apartment! Now in our culture, pink also has strong connotations: it is perceived as a feminine or childish color and we cannot help but think about bubble gum and popsicles when being told the word PINK. There are MANY shades of pinks you can choose from: the basic idea to get to pink is associating a vibrant hue of red with a hint of white. But then, it also includes most of the orange and purple variations - as long as they have a strong red component and some white. In other words, there are as many shades of pinks as shades of greys - below are just a few variations as an example. You do not need to paint your entire room in pink to get its warm feel: a few accessories here and there, with the right hue (see comment above) can do the trick rather easily: accent pillows, a touch of pink in an artwork, your tea towels in the kitchen, a nice coffee table book cover... Possibilities are endless. The ombre trend going on right now also offers you interesting options to add pink in your interior. Pink works with most colors and while associated with yellow, you would definitely get a rather juvenile feel, it can also add sophistication if combined to a warm grey, a lilac shade or a deep brown. If you are unsure about going pink, test it out with flowers! As Spring is upon us and flowers are starting to bloom, bring some nice cherry blossoms, pretty tulips or roses to your interior. Flowers come in many shades of pinks as well so try out different ones and see how it feels. 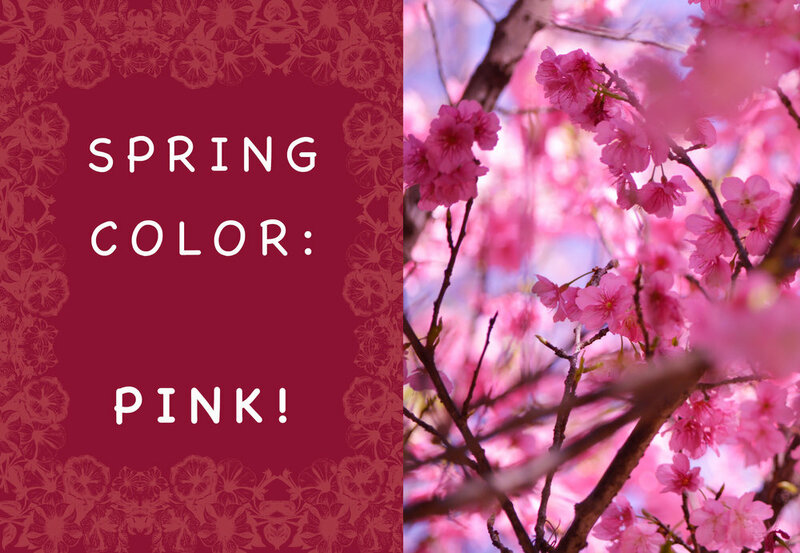 In conclusion, pink is a great color to play with, it will make people feel at ease and willing to socialize so give it a try, be... playful and enjoy Spring! For more ideas on pink, go to our Pink board on Pinterest!